A prince investigates the appearance of a forest god that has become a demon after being poisoned by a strange ball of iron. He meets a variety of people on his journey, including a mysterious princess of the forest. As the movie builds to its climax, a large assortment of natural forces comes into conflict with each other and the humans, in a battle that will decide the fate of the forest. 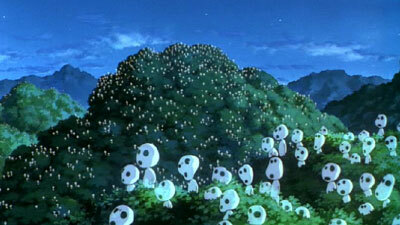 Princess Mononoke was, at one point at least, the highest grossing film in Japanese history. (James Cameron’s Titanic bested it a few months later.) Disney’s Miramax division thought highly enough of its commercial potential in the United States to hire famed fantasy novelist and comic book writer Neil Gaiman to do the English language translation, then well-known American actors were hired to provide voices for the US dub. However, when it was finally released theatrically, it got dumped into just 129 theatres, largely art houses, and got little promotion on its way to making just over 2 million dollars in its American engagement. It received a lackluster DVD release way back in 2000, and now it has taken until 2014 before finally getting its Blu-ray release. In Princess Mononoke, Prince Ashitaka is the future leader of his people, in a time when the old gods are retreating further away from humanity. Ashitaka is out in the fields one day when he is attacked by a worm/boar monster. This creature is actually a forest god who has become a demon. Ashitaka manages to kill the demon, but at the same time he makes contact with it, and that touch means that his arm is now cursed (and painful and throbbing). A wizened woman from the village named Oracle comes out to say farewell to the god and to wish it well, but the god responds with a message of loathing. It has no love for humans, it seems. Oracle finds an object in the body of the dead god, a ball of iron. It seems that it was the iron that drove the boar mad and transformed it into a demon. It will be up to Ashitaka to investigate this ball of iron by traveling west. It is hoped that he will also find a cure for his fatal curse. On the way, he encounters samurai, and soon after a self-described priest named Jika. The priest tells Ashitaka of a great forest to the west, where live god-beasts and a being that has the power of healing. The information is enough to convince Ashitaka that his path lies to the west. He travels to the forest, encountering two wounded men, hurt in a conflict with a wolf god. Ashitaka also gets his first glimpse of a mysterious girl as she tends to the wolf god. Beast gods are not the only strange denizens of the forest, as little odd white creatures identified as “kodomas” lead Ashitaka and the wounded men back towards their village, actually a fortified ironworks ruled by Lady Eboshi. 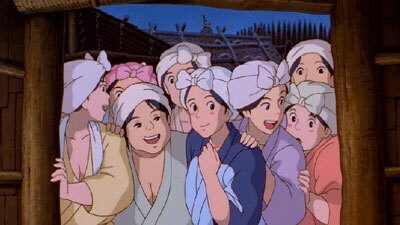 Ashitaka is welcomed in a fashion, and meets the ironworks workers and Lady Eboshi herself. The ironworks holds the secret of the demon god that attacked Ashitaka, as well as that of the mysterious girl, named Princess Mononoke. 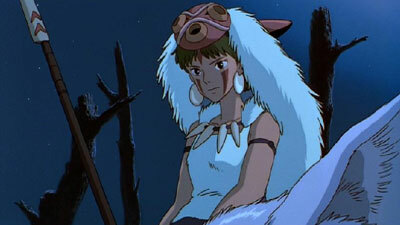 Mononoke is human, but has become part of the wolf tribe, and hates humans for what they are doing to the forest. In fact, the various beast gods are all upset at how the ironworks workers have been clearing forest to mine for more iron. 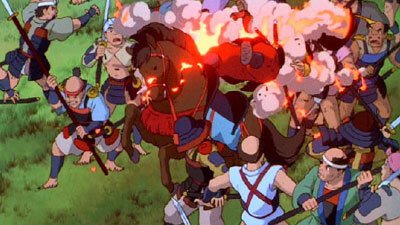 This leads to a massive conflict which involves the ironworks men and women, the beast gods and lower animals, the emperor’s men, Princess Mononoke, and the Spirit Of The Forest, who holds the ultimate prize… and Ashitaka is caught in the middle of it all, trying to make sense of the war. 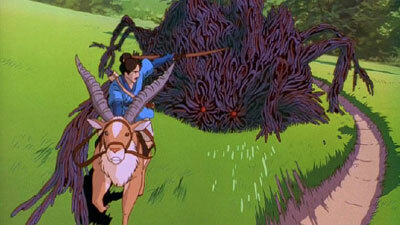 The brilliance of Princess Mononoke is that there are not really any heroes and villains. Anyone seeing this film may develop his or her own ideas about who is right or wrong. Lady Eboshi, for example, represents the industrialization of society and its effrontery to nature, but on the other hand she also buys out contracts of brothel girls to give them better lives, and helps lepers. (However, she does use these people for her own purposes.) The beast gods are protecting their land, but are more interested in fighting than reasoning. 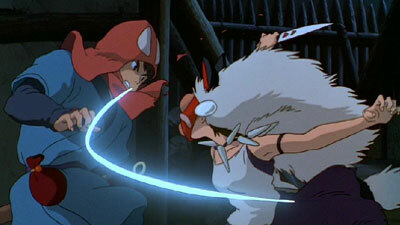 Mononoke is a walking dichotomy: a human who fights for the beasts. The film is drawn with black lines against white, but the colors are tones of grey. In the end, there is conflict, and there is resolution, but there is no victory. The film concludes in a similar fashion to the Lord Of The Rings trilogy: it is the end of an age, and we can see how the end of one world led to the creation of the one we live in now. 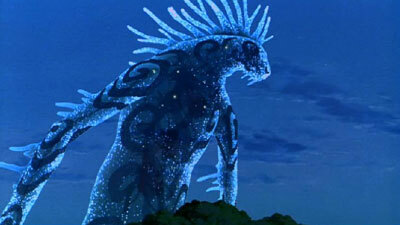 Throughout the film, we are treated to powerful imagery, which well suits a story of this magnitude; however, do not think that this is one of those epics without human scale. On the contrary, the massiveness of the story comes mainly from its themes, not its content. This is a personal story of, mainly, Ashitaka and Mononoke. Ashitaka fulfills the role of the character with whom the audience is meant to identify, as he struggles to comprehend what is happening. It is not that the events are unclear, though; what confuses him and the viewer is how all the players have developed their motivations, and why they have let themselves be taken over by hatred. This is a story of the futility of war, but also of its transforming power on society. 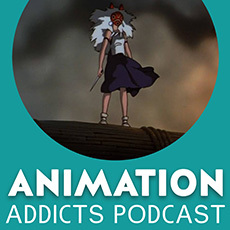 Princess Mononoke has exciting animation, interesting characters, a sophisticated and intelligent story, lots of action, a bit of humor, and a window into Japanese culture and myth. 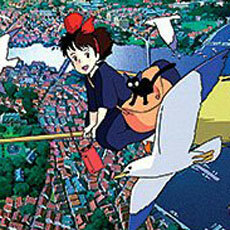 It is a modern classic, and one of the best from Studio Ghibli. With all that time they had between the 2000 DVD release and now, you would hope that the Blu-ray would easily best the somewhat lacking DVD release, which had little in the way of bonus material. To a large extent, they have done so, with the only exception being noted in the audio section of this review. 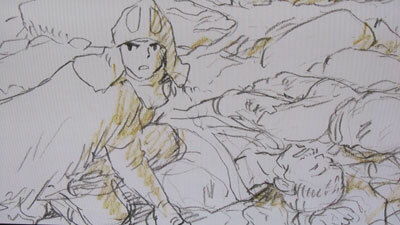 One thing that was lacking on the DVD, but has since become a staple of Ghibli discs, is the option to view the complete storyboards for the film. Also new here are the Original Japanese and English Trailers (14:20) for the film, this time in hi-definition, plus TV Spots (11:33) in letterboxed standard definition. Then, also in standard definition but in the 4:3 ratio, there is another Original English Trailer (2:03) (which was on the DVD). The original DVD also had a Featurette (5:05) that is repeated here, focusing on the English voice cast and script. 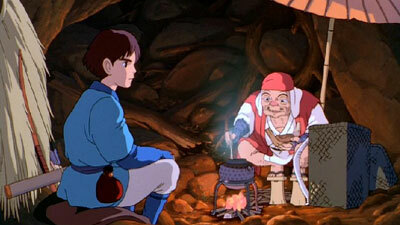 Everyone goes to lengths to say how this isn’t your basic kids’ cartoon, and praise Miyazaki. 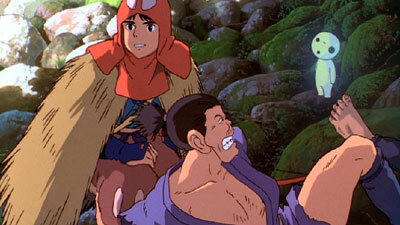 A great new addition is Princess Mononoke In the USA (19:57). It is, surprisingly, a Japanese featurette, with English subtitles. 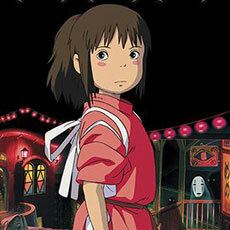 The title is also ironic, since the featurette begins in Toronto, Canada, trailing Miyazaki at the Toronto International Film Festival, where Princess Mononoke closed the festival. 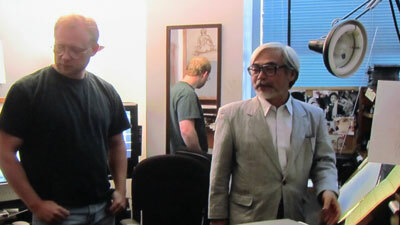 Soon, though, the mini-documentary follows Miyazaki to Los Angeles, where he visits the Disney studios and meets some animators. There is a good deal of footage of Miyazaki discussing his film, and his feelings on children’s entertainment. Trailers that open the disc include “spots” for 101 Dalmatians (get it? “spots?”), Big Hero 6, and Legend Of The Neverbeast. Sneak Peeks selected from the main menu brings us more ads, for Frozen: Sing Along Edition, Star Wars: Clone Wars and a teaser for the live action Cinderella. Oddly, there are no ads for Ghibli titles. 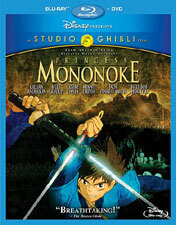 The DVD has trailers for Brave, and the Cinderella: Diamond Edition, plus the Princess Mononoke featurette and trailer. Standard Blu-ray case, with a Blu-ray and a DVD on either side of the case. There are inserts for Disney Movie Club and Disney Movie Rewards. The cover slip is subtly embossed. I always thought that the old DVD had a faded, sketchy, boring look, so the Blu-ray is a revelation. The hi-def image has a much greater range of colors, so much more brilliant than on the DVD, and the outlines are more stable. The picture is just so much more alive now, erasing my impression of this movie being drab in appearance. This is a great upgrade, though it exchanges the 1.85:1 ratio on the DVD for a newly framed 16:9 ratio. The DVD looks much like the old one, repeating the 1.85:1 aspect ratio, and having similar colors; but the picture on the newly pressed DVD in this set is a little zoomed in, and loses some detail when compared to the old one. 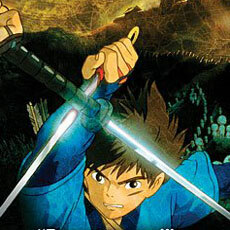 With the 2000 DVD, Disney initially planned to not include the original Japanese language track, an almost unthinkable cardinal sin among anime fans. These fans let their voices be heard, and Disney delayed the Region 1 DVD in order to add the Japanese track, as well as subtitles that directly translated it. The Japanese audio track is still here on the Blu-ray, along with the English dub, each given DTS-HD Master Audio 5.1 tracks. 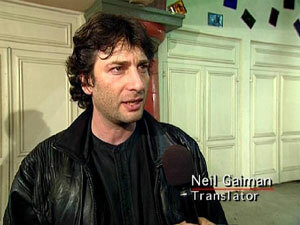 Disney spent good money to have acclaimed fantasy novelist and comic book author Neil Gaiman write the English translation. At the time, the Brit was best known for the Sandman comic published by DC’s Vertigo Comics. Gaiman was given credit for being faithful to the spirit of the Japanese script, while bringing a more “Western” sensibility that could be better understood by English-speaking audiences. There are cases where, for example, a Japanese figure of speech does not translate well, so an English substitute would have to be found. Plus, references to aspects of Japanese mythology not familiar to non-Japanese had to be addressed, and cultural sensibilities were taken into consideration. For example, where the Japanese track made much mention of “gods,” Gaiman’s translation sometimes used terms such as “beast” or “spirit.” Gaiman also did his best to roughly match the syntax of the speech, in order to have the dialog match the lip movements as well as possible. Overall, the English dialog comes off very well. As Disney hired lots of big-name voice actors for the dub, I should probably discuss them. 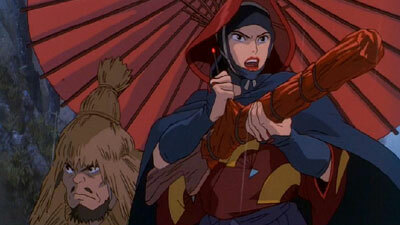 I do like Billy Crudup and Claire Danes quite a bit in their roles of Ashitaka and Mononoke, and Minnie Driver does very well as Lady Eboshi. On the flip side, I cringe every time that Billy Bob Thornton speaks as Jika, and Gillian Anderson goes husky-voiced to read for the wolf god Moro. I am not saying that the latter two actors did a poor job, but I did not feel they were well cast. But, at least Moro sounds female in the English dub, which cannot be said on the Japanese track. Immediately when the movie opens, there is a strong thud, and the room comes absolutely alive with sound. It is a very impressive start, which is nearly kept up for the rest of the film. Whichever language you listen to, you will not be disappointed by the superb quality of this immersive soundtrack, though the Japanese track is the stronger of the two, being less focused on the dialog and giving more attention to ambient sounds. Inexplicably, what is missing on the Blu-ray is the subtitle track to go with the Japanese audio. 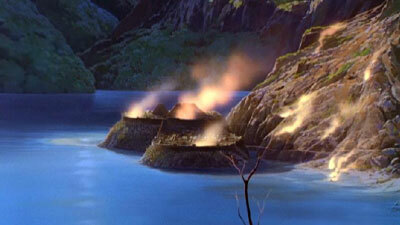 This is a horrible omission, one that was also made on the Castle In The Sky Blu-ray. 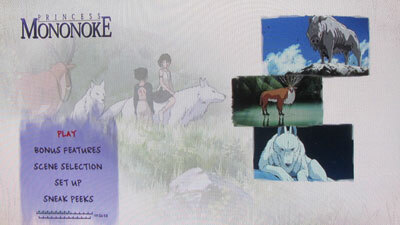 While the original Princess Mononoke DVD had subtitles for both versions of the script (captions for the English dub, and literal subtitles for the Japanese track), the Blu-ray dumps the literal translation of the Japanese, and offers only “dubtitles, ” in addition to captions that are also based on the English track. This is really a shame, as one of the joys of viewing the DVD was to compare the two subtitle tracks, and see both the original intent of the filmmakers, and how the film was adapted for a western audience. The opportunity to enjoy the original script, and to better appreciate the Japanese culture, has now been lost; and thus the viewer gets only the westernized version. There is nothing “wrong” about Gaiman’s translation, but it isn’t the original script. For that I reason, I recommend hanging on to your old DVD if you have it. Disney really dropped the ball on this one, and it almost ruins the Blu-ray for me. The audio score in this review has been downgraded accordingly to reflect my dissatisfaction. The Blu-ray also includes an audio track and subtitles in French. The DVD in this set has the same audio language options, but only English subtitles and captions. Princess Mononoke is an ecological fable, a film about forest gods and their conflict with the coming of human industry in mythical Japan, told with an unusual level of sophistication in its portrayal of characters that conflict with one another, but do not prescribe to roles of good and evil. The story is more layered and philosophical than most, but tells its tale in a very entertaining manner. The full force of the story will likely only hit you once it is all done, and the true effect of it will sink in as the credits roll. It is great to see one of my favorites in high definition at last, taking a long time as it did to migrate to Blu-ray after several other Ghibli titles already surfaced on the format. It seems that Disney held it back only to screw it up, however, as they removed the subtitle track that translated the Japanese script (and they even did the same on the newly pressed DVD, which therefore becomes lesser than the original release). We are left with only dubtitles, and while the dub is well done, we have been robbed of the opportunity to enjoy the film as originally intended by its makers. At least we do get an improved set of bonus features, including full storyboards, numerous trailers and TV spots, and a new-to-disc featurette. The video is a huge upgrade from the original DVD as well, so with only mild hesitation I do recommend this Blu-ray for fans of Studio Ghibli.